Press each rectangle to make 8x4-inch rectangle. Cut each rectangle into two 4-inch squares. Spoon about 1/2 tablespoon hazelnut spread onto center of each square; spread to within 1/2 inch of edges. In small bowl, gently stir together hazelnuts and chopped pear. Spoon 1/8 pear mixture over hazelnut spread on each square. Fold corners over filling, forming triangles; press edges with fork to seal. Place on ungreased cookie sheet. Prick tops of each with fork. Bake 12 to 15 minutes or until golden brown. 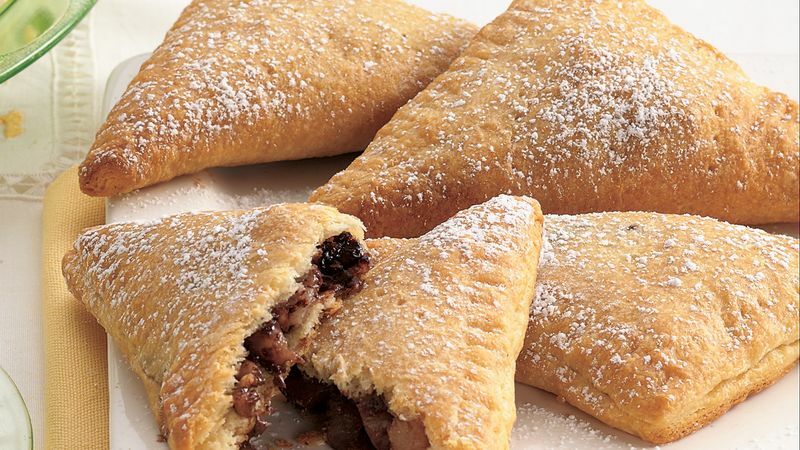 Sprinkle powdered sugar over warm turnovers. Serve warm, or cool completely before serving. Hazelnut-cocoa spread originated in Europe. Rich and sweet, it is used in much the same way we use peanut butter. Several brands are imported to the United States and are available in large grocery stores. Look for it by the peanut butter.